People take smartphone photos as Communist Party delegates participate in a group interview with the media on the sidelines of China's 19th Party Congress (Oct. 19, 2017). A number of prominent foreign media were barred from the press conference revealing China’s new leadership. It is widely known that foreign journalists encounter various strict restrictions when reporting on China — particularly since Chinese President Xi Jinping came into office five years ago. But China just sent another strong message to the “trouble-making” foreign media that an even more difficult situation is waiting for them. On October 25, when the Chinese Communist Party (CCP) revealed its new lineup of top leaders — the result the whole world has been anticipating for months — a number of prominent Western news organizations were denied access to the critical press conference at the last minute. The Guardian said it was “ the first time in more than two decades” its reporters had experienced such treatment. The Guardian also claimed that the Chinese officials didn’t offer any formal explanation for the decision. “Using media access as a tool to punish journalists whose coverage the Chinese authorities disapprove of is a gross violation of the principles of press freedom,” FCCC further protested in its statement. Unfortunately, it’s also a typical way for the CCP to punish foreign journalists. 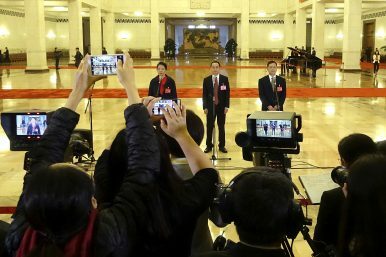 Voice of America (VOA), for example, having been labeled as an “anti-China media outlet” by the Chinese authorities long ago, was denied access not only to the final critical press conference, but all the other press conferences during the 19th Party Congress. Luckily, VOA was still allowed to enter the lobby of the Great Hall of the People, where the Party Congress took place. By intentionally barring five prominent Western media organizations along with so-called “anti-China media” like VOA, the CCP sent a strong message toward the whole community of foreign media: any media organization, no matter how famous or prominent it is worldwide, can be punished in China. Not offering any official explanation for the move is an old trick CCP trick to manipulate media and encourage self-censorship. “We do not need lavish praise from others. However, we do welcome objective reporting and constructive suggestions,” Xi added, implying that “unobjective” reporting — according to the CCP’s criteria — is not welcome in China.